Gazing out a window facing Third St. near the Beverly Center, I watched various people walking by, while waiting for a friend to join me for lunch. A server inside The Izaka-Ya by Katsu-Ya, welcomed me and handed a packaged pre-moistened terry cotton towelette and two menus. Hungry patrons entered and took seats at the sushi bar and various tables. An Izakaya in Japan is a popular sake spot. People come in and sip sake and other drinks while enjoying small-bites after work. Here in Los Angeles, The Izaka-Ya by Katsu-Ya is a neighborhood place where people flock for sushi, sashimi and other Japanese specialties. This is one of five restaurants Katsuya Uechi owns in the Los Angeles area. Born in Okinawa, Japan, he arrived to the U.S. in the mid 1980s and worked in a few restaurants. 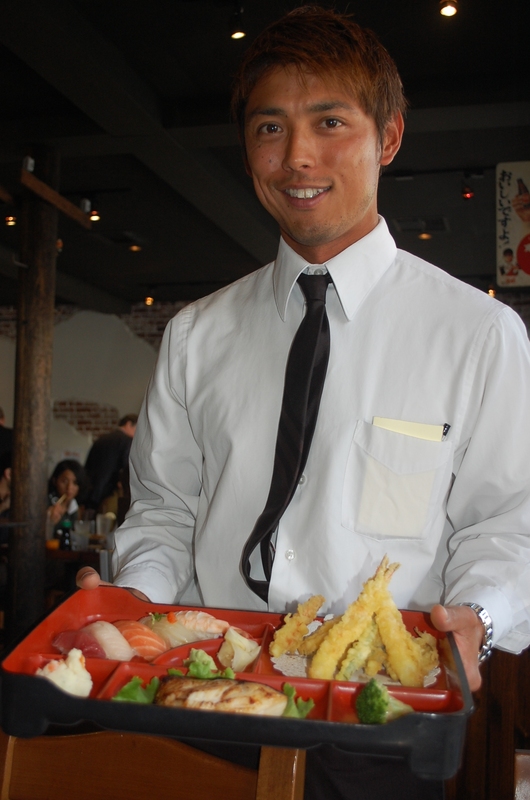 Then in 1997, Katsuya opened his first restaurant in Studio City. What made his restaurant a success, was that Chef Katsuya studied the eating habits of his American guests and mixed California-style into his traditional Japanese dishes. Read the rest of my review courtesy of the Beverly Press/Park La Brea News, published on Dec. 29, 2011. Click on this link via The Izaka-Ya by Katsu-Ya: Japanese Food with an American Flair.